Author contributions: Nakamura M performed the majority of experiments; Ikeda M and Kato N provided reagents and were involved in editing the manuscript; Hokari R, Hibi T and Miura S provided financial support for this work; Saito H designed the study, provided financial support and wrote the manuscript. AIM: To elucidate the effect of antioxidants, resveratrol (RVT) and astaxanthin (AXN), on hepatitis C virus (HCV) replication. METHODS: We investigated the effect of recent popular antioxidant supplements on replication of the HCV replicon system OR6. RVT is a strong antioxidant and a kind of polyphenol that inhibits replication of various viruses. AXN is also a strong antioxidant. The replication of HCV RNA was assessed by the luciferase reporter assay. An additive effect of antioxidants on antiviral effects of interferon (IFN) and ribavirin (RBV) was investigated. RESULTS: This is the first report to investigate the effect of RVT and AXN on HCV replication. In contrast to other reported viruses, RVT significantly enhanced HCV RNA replication. Vitamin E also enhanced HCV RNA replication as reported previously, although AXN didnot affect replication. IFN and RBV significantly reduced HCV RNA replication, but these effects were dose-dependently hampered and attenuated by the addition of RVT. AXN didnot affect antiviral effects of IFN or RBV. CONCLUSION: These results suggested that RVT is not suitable as an antioxidant therapy for chronic hepatitis C.
Chronic liver disease develops in over 70% of those infected with hepatitis C virus (HCV), and HCV is now the most common cause of liver cirrhosis and also hepatocellular carcinoma (HCC), especially in Japan. It has been said that the median time for progression to cirrhosis is 30-40 years, but other factors such as male gender, the age at infection, co-infection with hepatitis B virus or human immunodeficiency virus (HIV), and alcohol consumption accelerate progression of this chronic disease. Oxidative stress has been postulated to be one of the deleterious factors of chronic hepatitis, and it was reported that antioxidant levels were significantly reduced in chronic hepatitis and cirrhosis. Moreover, it was also found that HCV proteins themselves generate oxidative stress, and the additive effect of oxidative stress caused by the inflammatory process in hepatitis and that induced by HCV proteins may further advance the disease stage of chronic hepatitis C. Therefore, it is thought that antioxidant therapy has a role in slowing disease progression to cirrhosis and subsequent HCC. In fact, there are studies suggesting a beneficial effect of antioxidant therapy for patients who didnot respond to interferon (IFN) therapy, and that a combination of antiviral and antioxidant therapies may enhance the overall response rate of patients with chronic hepatitis C[3,4]. Current recommended therapy for previously untreated and relapsed patients is a combination of pegylated interferon (Peg-IFN) and ribavirin (RBV), resulting in a sustained virological response in around 50% of genotype 1 patients with high viral load. Recent studies have shown that protease and polymerase inhibitors possess a strong additive effect on antiviral therapy of Peg-IFN/RBV and seem to be promising. However, these regimens are expensive and adverse effects are sometimes severe and frequent, meaning that large numbers of patients give up treatment for a variety of reasons. These conditions have lead patients with chronic hepatitis C to use complementary and alternative medicine (CAM) including various supplements, and a previous survey found that about 40% of patients of liver disease outpatient clinics in the US used CAM at least once during the preceding month. Moreover, a large number of supplements are used by patients universally to maintain their health condition or improve quality of life even if they are cared by medical doctors and they always do not tell doctors whether they used CAM and/or supplements. The most frequent CAM or supplements taken by patients with chronic hepatitis C were antioxidants, which may be beneficial for this disease as described above. Resveratrol (RVT) was discovered to be a strong activator of sirtuin, a gene for longevity, and has been implicated as the most important polyphenol responsible for the beneficial effects of red wine consumption, which has been called as the “French Paradox”. Polyphenols contained in red wine have shown a strong antioxidative effect on cardioprotection, anti-atherosclerosis and relaxation of vascular endothelium through nitric oxide release. Sirtuin is activated when a person undergoes calorie restriction, and RVT is thought to be a surrogate for calorie restriction, which induces stabilization of DNA and also increases longevity by 70%. RVT is also known to improve liver lesions such as acetaminophen-induced hepatic injury and liver fibrosis in the mouse. When RVT was administered to mice fed a high-fat diet, fatty liver induced by this high-calorie diet was significantly improved. In addition to these favorable reactions, it has been reported that RVT inhibited viral replication of several major viruses, such as cytomegalovirus (CMV), varicella-zoster, influenza A, and herpes simplex virus (HSV)[12-15]. This supplement is popular and is thought to be one of candidates for the supplemental treatment of chronic hepatitis C.
Another candidate is astaxanthin (AXN: 3,3’-dihydroxy-b, b-carotene-4,4’-dione), which also showed a strong antioxidative effect. AXN is the carotenoid responsible for the pink pigmentation in the flesh of salmon, lobster, krill and other aquatic animals and plants. Recent studies have indicated that AXN is more powerful than its carotenoid cousin, β carotene, at neutralizing singlet oxygen. This supplement is known to improve the condition of so-called metabolic syndrome[18,19], and is therefore popular. The antiviral effect of this supplement has not been examined so far. These reports suggested that RVT and AXN might be good candidates for an antioxidative as well as an anti-HCV agent. However, we have no information whether these antioxidants affect HCV replication or not and if they are suitable for patients with chronic hepatitis C. In this study, we tried to assess the effect of these antioxidants on HCV replication using the HCV replicon system as an in vitro tool. This is the first report to investigate the effect of RVT and AXN on HCV replication in vitro. OR6 cells, a cell line cloned from ORN/C-5B/KE cells supporting genome-length HCV RNA (strain O of genotype 1b) encoding the luciferase reporter gene, were used. This cell line was originally derived from a hepatoma cell line, HuH-7, as described elsewhere. 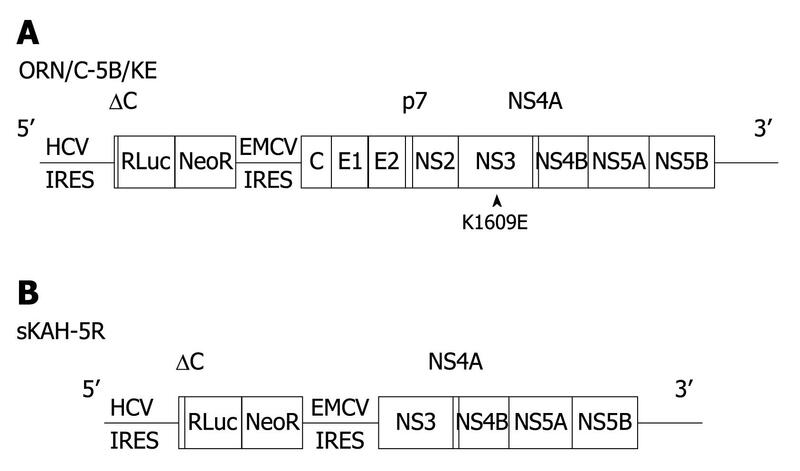 The schematic organization of the ORN/C-5B/KE gene is shown in Figure 1A. This cell line was cultured and maintained as previously reported. Another cell line used was sKAH-5R, which was established from a patient with acute hepatitis C, having subgenomic HCV RNA encoding the luciferase reporter gene (Figure 1B). The latter cell line was cultured under the same conditions as the OR6 cells, which includes the gene without a structural region of HCV RNA from the ORN/C-5B/KE gene. Figure 1 Organization of hepatitis C virus (HCV) RNA used in the replicon systems. A: Genome-length HCV RNA generated in OR6 cells; B: Subgenomic HCV RNA used in sKAH-5R and s1B-4R cells. Structural region of HCV RNA was deficient in the replicated RNA of sKAH-5R and s1B-4R cells. We evaluated RVT and AXN as new supplements, and vitamin E (VE) was used as a control because its effect on the HCV replicon system was already reported elsewhere. RVT (3,5,4’-trihydroxystilbene), RBV (1-b-D-ribofuranosyl-1H-1,2,4-triazole-3-carboxamide), AXN (3,3’-dihydroxy-b,b-carotene-4,4’-dione), VE and IFN-2b were purchased from Sigma-Aldrich Japan (Tokyo, Japan). AXN, RVT and VE were prepared as 10-20 mg/mL stock solutions in dimethylsulfoxide (DMSO) and stored at -80°C until used. This stock solution was diluted with culture medium. The final concentration of DMSO was 0.2%, which didnot interfere with viral replication, the highest concentration of RVT used in this study was 100 μmol/L, that of AXN was 50 μmol/L, and that of VE was 15 μmol/L. To monitor the anti-HCV effects of IFN and RBV on replication, OR6 cells (1.5 × 104 /well) were plated onto 24-well plates at least in triplicate for each assay and cultured for 4 h. Then the cells were treated with IFN at a final concentration of 1, 2, 4, 10, or 20 U/mL or RBV at a final concentration of 10 or 25 μmol/L for 72 h, harvested with renilla lysis reagent (Promega, Madison, WI), and assayed for luciferase activity according to the manufacturer’s protocol. The same protocol was applied for sKAH-5R cells. The additive effect of RVB, RVT and AXN on the antiviral effect of IFN (1 U) was studied and compared using luciferase activity. Approximately 1 to 4.5 × 104 cells were plated onto 6-well plates and cultured for 24 h. Cells were treated with each agent for 72 h. The cells were then harvested with Renilla lysis reagent and subjected to the Renilla luciferase (RL) assay according to the manufacturer’s protocol. We tested the toxic effect of RBV as described elsewhere. The effect of RVT (5-100 μmol/L) and AXN (1-50 μmol/L) on cell viability was investigated. To examine the cytotoxic effect of RVT and AXN on cells with replicon RNA, the cells were seeded at a density of 2 × 105 cells per dish onto 6-well plates. After 24 h culture, the cells were treated with RVT at final concentrations of 25 and 50 μmol/L in the absence of G418. After incubation for 72 h, the number of viable cells was counted in an improved Neubauer-type hemocytometer after trypan blue dye (Invitrogen, Carlsbad, CA) treatment. The difference in relative luciferase activity was tested using the Student’s t-test and the Mann-Whitney U-test as appropriate. P-values < 0.05 were considered statistically significant. Every experiment was performed in triplicate and two independent experiments were done. The effect of RVT and AXN was examined in comparison to that of VE, using the OR6 assay system, in which genomic length HCV RNA replication is represented by RL fluorescence activity. After treatment of OR6 cells with various concentrations of RVT for 72 h, the luciferase activity was dose-dependently increased up to 20 mol/L (Figure 2A). The activity gradually decreased at higher concentrations, but at 100 mol/L it was still higher than that without RVT. Since it has been reported that the proliferation of the HCV subgenomic replicon is dependent on host-cell growth, we examined the effect of RVT on cell number and viability of OR6 cells by the trypan blue dye exclusion test. As shown in Figure 2B, RVT didnot increase OR6 cells until 15 μmol/L, and the cell viability decreased at higher concentrations than 20 μmol/L of RVT. This decrease seen in higher concentrations paralleled the luciferase activity shown in Figure 2A, and it seemed that RVT further enhanced HCV RNA replication at concentrations higher than 20 μmol/L when estimated by the number of viable cells. Different from the effect of RVT, AXN didnot enhance luciferase activity (Figure 2C). The luciferase activity decreased at a concentration more than 10 μmol/L, and this decrease seemed to be due to decrease in cell viability (Figure 2D). 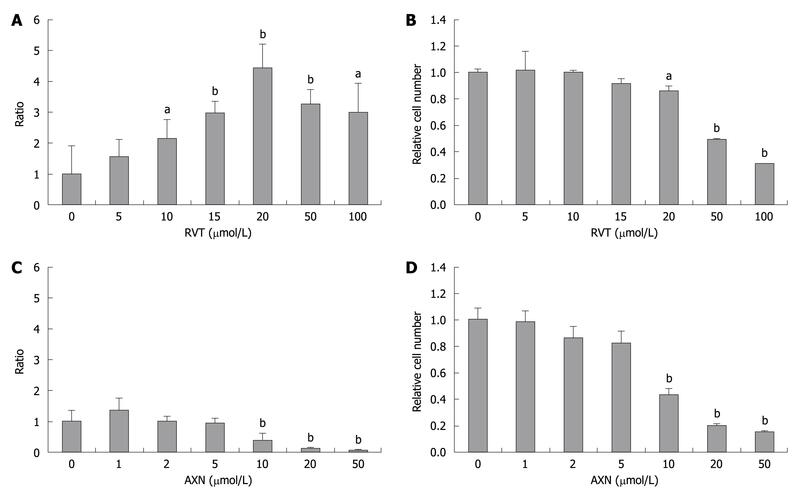 Figure 2 Luciferase activity and cell viability of OR6 cells after addition of resveratrol (RVT) and astaxanthin (AXN) for 72 h. The indicated concentrations of RVT or AXN were added to the culture medium of OR6 cells, and after 72 h of culture, cells were harvested with Runilla lysis buffer and the lysate was subjected to the luciferase assay. Cell viability was evaluated by a trypan blue dye exclusion assay. A: Luciferase activity after addition of RVT; B: Cell viability after addition of RVT; C: Luciferase activity after addition of AXN; D: Cell viability after addition of AXN. aP < 0.05, bP < 0.01. VE dose-dependently increased luciferase activity up to a concentration of 15 μmol/L (Figure 3). This result indicated that VE also upregulates HCV RNA replication in OR6 cells. The cytotoxic effect of VE was not observed in the cell viability test. This result was compatible to the data already reported elsewhere. Figure 3 The effect of vitamin E (VE) on luciferase activity and cell viability of OR6 cells (72 h). Cells were treated with the indicated concentrations of VE for 72 h. A: Luciferase activity after addition of VE; B: Cell viability after addition of RVT and VE. bP < 0.01. Next, we further investigated the effect of RVT on other clones of HCV RNA. We tested the effect of RVT on the subgenomic HCV RNA-replicating cell, sKAH-5R. RVT also enhanced the replication of sKAH-5R subgenomic HCV RNA at 2-10 μmol/L (Figure 4A). This concentration is not toxic to the sKAH-5R cells, but more than 20 μmol/L of RVT was toxic to sKAH-5R cells (Figure 4B). Thus, subgenomic replicons showed the same results observed in the full-genome length replicon. Figure 4 The effect of resveratrol on subgenomic replicon cells, sKAH-5R. RVT was added to the cells for 72 h and luciferase activity was assayed as was indicated in Figure 2. A: Luciferase activity after addition of RVT; B: Cell viability after addition of RVT. aP < 0.05, bP < 0.01. The effects of IFN-2b and RBV were independently applied to these cells to demonstrate that anti-viral agents reduce HCV RNA replication in this cell line. Figure 5A shows the time course of luciferase activity after administration of IFN. Luciferase activity was dose-dependently inhibited by IFN. Figure 5B shows the effect of RBV at concentrations of 10 and 25 μmol/L on luciferase activity of OR6 cells 72 h after addition of RBV in comparison to that of IFN (1 U/mL). RBV also reduced luciferase activity of OR6 cells dose-dependently, but the effect was smaller than that of IFN. Anti-viral effects of IFN and RBV were thus confirmed in this cell line. Figure 5 Sequential change of luciferase activity of OS6 cells after addition of interferon (IFN). A: IFN was added for the indicated duration and the ratio to the luciferase activity at time 0 was shown. Statistical significance (aP < 0.05, bP < 0.01) is shown below: at 24 h 0 vs 1a, 2b, 4b, 10b and 20b; at 48 h, 0 vs 1b, 2b, 4b, 10b and 20b; 1 vs 2b, 4b, 10b and 20b; 20 vs 2b, 4b and 10b; at 72 h, 0 vs 1b, 2b, 4b, 10b and 20b; 1 vs 2a; 1 vs 4b, 10b and 20b; 2 vs 4b, 10b and 20b; 4 vs 10b and 20b; 10 vs 20b; B: Luciferase activity after addition of RVB and IFN for 72 h was shown as the ratio to that without antiviral agents. aP < 0.05, bP < 0.01. We then investigated whether RVT reverses the anti-viral effects of RBV and IFN. Luciferase activity of OR6 cells 72 h after treatment with RBV or IFN was compared to treatment with RBV plus RVT or IFN plus RVT (Figure 6A). The effect of treatment with 10 μmol/L of RVT alone on OR6 cells showed a 2.1-fold increase of luciferase activity. The addition of RVT (10 μmol/L) to RBV- or IFN-treated cells reversed the anti-proliferative effect of RBV on HCV RNA even when the cells were treated with 25 μmol/L of RBV plus 1 U/mL of IFN, which was normally enough to reduce HCV RNA to 1/5 (Figure 5B). Ten μmol/L RVT upregulated luciferase activity in RBV- or IFN-treated OR6 cells around 2-fold and 4.2-fold, respectively (Figure 6A). On the other hand, AXN didnot affect the effect of RBV and IFN (Figure 6B), indicating that AXN has no disadvantageous effect on antiviral activity of IFN and RBV. Figure 6 The enhancing effect of RVT on replication of HCV RNA, even when treated with ribavirin (RBV) and IFN. RVT was simultaneously added to RBV or IFN. A: The ratio was calculated as the ratio of luciferase activity with RVT to that without RVT. bP < 0.01 vs RVT 0; B: The same procedure was applied in AXN. This proliferative effect of RVT was further emphasized by comparison to the additive effects of RBV with IFN. We compared the dose-dependent effect of RBV, RVT and AXN on the anti-proliferative effect of IFN (Figure 7). RBV (A), RVT (B) and AXN (C) were added to OS6 cells at concentrations of 0, 1, 2, 5, 10 or 15 μmol/L with 1 U/mL of IFN for 48 h. The ratio between luciferase activity of RBV-, RVT- or AXN-treated cells and that without co-treatment is shown. RBV further reduced the IFN-induced decrease in luciferase activity (Figure 7A), while RVT reversed this decrease, and further increased luciferase activity (Figure 7B). This effect was dose-dependent and it is noted that the enhanced ratio was strikingly large. On the other hand, AXN didnot affect antiviral effect of IFN (Figure 7C). Figure 7 The comparative effect of RBV (A), RVT (B) and AXN (C) on the luciferase activity of IFN-treated cells. Cells were simultaneously treated with 1 U/mL of IFN and the indicated concentrations of RBV, RVT and AXN were added with IFN. We have shown that RVT, a natural polyphenol contained in red wine and peanuts, enhanced in vitro replication of HCV RNA without producing significant proliferation of host cells. This is the first report demonstrating a proliferative effect of RVT on HCV. RVT inhibited replication of HSV-1, HSV-2[25-27] human CMV, Influenza A and orthomyxo virus. Moreover, it was reported that RVT inhibited replication of HIV-1 synergistically with nucleoside analogues. These reports suggest that RVT has a broad spectrum of anti-viral activities, and that RVT may selectively target the host, rather than the virus, as a mode of action for inhibiting viral replication. In spite of these inhibitory effects on viral replication, the mechanism of enhancing replication of HCV RNA is unclear. These results suggested that RVT is not suitable for antioxidant therapy of chronic hepatitis C. We also examined the effect of VE on replication of HCV RNA in OS6 cells, and VE enhanced its replication as effectively as RVT. On the other hand, AXN didnot enhance replication of HCV RNA and had no effect on antiviral activity of IFN and RBV. These results indicated that we could recommend patients with chronic hepatitis C do not take RVT, especially when they receive antiviral therapy. RVT is a non-flavonoid polyphenol and exerts anti-oxidative, anti-neoplastic and anti-inflammatory properties. Moreover, RVT has received much attention as an agent for prolongation of lifespan by activating silent information regulator 2 proteins, or sirtuins, which are implicated in influencing aging and regulating transcription, apoptosis and stress resistance. These are causes for the popularity of this supplementation. Therapeutic intervention in liver injury with RVT has been suggested in various liver diseases, such as alcohol-induced liver disease, drug-induced liver injury, ischemia-reperfusion injury, and fatty liver diseases[11,34]. Furthermore, RVT has been implicated to be favorable for prevention of hepatic fibrosis[35,36]. These observations in combination with anti-viral effects indicated that RVT might be therapeutically beneficial or suitable for chronic hepatitis C. However, the direct effect of RVT on HCV RNA replication has not been studied thus far. In spite of our expectation, RVT didnot inhibit replication of HCV, and on the contrary, it enhanced replication. Moreover, RVT hampered the anti-viral effect of IFN or RBV, and HCV RNA replication was enhanced even when enough concentration of IFN or RBV was administered to OR6 cells to reduce HCV replication. This condition was quite different from that observed in HIV-1 replication, in which the effect of RVT was synergistic with anti-viral effect of nucleotide analogues. Unlike RVT, AXN didnot affect HCV replication and IFN-based antiviral activity, while it possesses strong antioxidant power. An immunological response against virus-infected cells is an important pathogenic mechanism of chronic viral hepatitis. Reactive oxygen species (ROS) produced by activated macrophages and a consequent rise of lipid peroxidation cause direct activation of hepatic stellate (Ito) cells, leading to hepatic fibrosis and cirrhosis. Moreover, HCV core protein directly increases ROS as well as lipid peroxidation products and antioxidant gene expression. HCV infection is also associated with liver iron accumulation, which further produces ROS in the liver. These observations suggested that anti-oxidant therapy has an important role in slowing disease progression to cirrhosis in chronic hepatitis C. In consequence of this theory, the use of CAM is common in patients with chronic liver disease. Liu et al reviewed medical herbs for HCV infection and concluded that some agents may have an effect on liver enzymes, but there is no firm evidence supporting efficacy of CAM. However, few studies have investigated the effect of antioxidants on HCV itself. Yano et al investigated the effect of ordinary nutrients on HCV RNA replication using the replicon system, and found that some antioxidants such as β-carotene, vitamin D2 and linoleic acid inhibited replication. They also showed an effect of VE on HCV RNA replication that was the same as in our study. In our study, AXN didnot affect replication of HCV RNA. Thus, there is a group of antioxidants which inhibit replication of HCV, while there is another group of antioxidants which enhance its replication. The precise mechanism of this difference has not been clarified, but the investigation of this mechanism may provide new insights into anti-viral mechanisms. Recently it has been demonstrated that anti-HCV nutrients induce activation of the MEK-ERK1/2 signaling pathway through phosphorylation of ERK1/2. Study of this phenomenon may provide clues for a new therapeutic strategy in anti-viral treatment of HCV. RVT has been shown to have a large number of regulatory biological functions, and Docherty et al[25-27] extensively studied the mechanism by which RVT inhibits the replication of HSV. However, even though it has been extensively studied, the molecular mechanism of RVT’s action is not clear. Our results were quite different from those of Docherty’s. In our study, not all antioxidants but 2 of 3 antioxidants increased the replication of HCV suggesting that the molecular mechanism of each agent is likely variable depending on viruses when we speculate in combination with studies of Docherty et al[25-27] and Yano et al. On the other hand, reports suggesting a correlation between HCV replication and lipid metabolism have accumulated recently. It has been demonstrated that the cellular lipid droplet is an important structure for replication or assembly of viral components of HCV, especially HCV core protein. The inhibitory effect of 3-hydroxyl-3-methylglutaryl coenzyme A reductase inhibitors on HCV have also been reported. Moreover, the success of peg-IFN plus RBV combination therapy, that resulted in the disappearance of HCV, affected lipid metabolism thereafter in vivo. Thus, it is conceivable that HCV genomic structure as well as the intracellular lipid is indispensable for viral replication of HCV. It is thought that RVT and VE affect intracellular lipid metabolism because they are lipid-soluble antioxidants. It is also interesting that HCV itself produces ROS, and that antioxidants affect the replication of HCV. Bechmann et al recently demonstrated that RVT in response to free fatty acid administration deteriorates fibrogenic activation of human hepatic stellate cells. They showed that RVT upregulated the expression of key mRNAs associated with activated, fibrogenic stellate cells, and also demonstrated that the combined presence of free fatty acids and RVT significantly reduced the hepatic stellate cells’ susceptibility to apoptosis. This report was controversial since previous reports[35,36] demonstrated favorable effects of RVT on prevention of fibrosis progression. Bechmann et al pointed out that the concentration of RVT was different from the previous study, and species’ differences (employing rat vs human hepatic stellate cells) might be significant. Thus, RVT may have different therapeutic effects at various concentrations, and further investigation is needed to clarify a role of RVT in chronic liver diseases. Their result also suggested that patients with chronic hepatitis C should not take RVT as an additive nutrient, especially when they receive IFN-based antiviral therapy. Further investigations focusing on the enhancing mechanism of RVT on HCV RNA and different responses between RVT and AXN is necessary, and these approaches may develop a new strategy of anti-HCV agents. In conclusion, we recommend patients with chronic hepatitis C who receive IFN-based antiviral therapy not to take RVT as an antioxidant supplement, although AXN may not affect anti-viral therapy. Antiviral therapy for chronic hepatitis C has been developing, but the current standard therapy with pegylated interferon (Peg-IFN) and ribavirin combination therapy for 12 mo has achieved around 50% of patients who are infected with genotype 1 hepatitis C virus (HCV). Patients who have not attained viral clearance tend to take several supplementations for this chronic disease with an expectation for retardation of disease progression. A previous survey found that about 40% of patients of liver disease outpatient clinics in the US used complementary and alternative medicine (CAM) at least once during the preceding month. Among CAM, antioxidants have been popularly used by patients with chronic hepatitis C because it is said that oxidative stress deteriorates chronic hepatitis. However, the information about the use of supplementations for chronic hepatitis C was insufficient. Resveratrol (RVT) was discovered to be a strong activator of sirtuin, a gene for longevity, and the most important polyphenol responsible for the beneficial effects of red wine, which has been called the “French Paradox”. RVT showed a strong antioxidative effect on cardioprotection, anti-atherosclerosis and relaxation of vascular endothelium through nitric oxide release. This information resulted in the popularity of this supplementation for people who suffered from chronic diseases. Since RVT inhibits the replication of other viruses, it is thought that RVT also inhibits HCV replication. However they revealed RVT enhanced HCV replication. The investigation on HCV replication has been enabled by using the replicon system, in which HCV RNA replicates but unfortunately viral particles were not produced. Recently, the cell culture system in which HCV particles are produced was developed by Dr. Wakita T, and many new insights of HCV virology have been discovered. This study focused on the effect of taking daily supplementations on viral replication and antiviral therapy of HCV. The authors recommend patients with chronic hepatitis C who receive IFN-based antiviral therapy not to take RVT as an antioxidant supplement, although astaxanthin (AXN) may not affect anti-viral therapy. In this study, Nakamura et al tried to show the efficacy of antioxidants, RVT and AXN, on HCV replication. Since RVT inhibits the replication of other viruses, it was thought that RVT also inhibited HCV replication. However they revealed RVT enhanced HCV replication. These results are very interesting.